Mother of Smoke is a play born out of an acting exercise. It’s billed as a mash up of Chuck Mee’s Trojan Women and Anton Chekhov’s The Cherry Orchard, but that’s not really what this is. This is a hodgepodge of ideas. This is not a knock on those ideas and it’s certainly not a knock on acting exercises. However, this play is more like a mosaic whose pieces all contain something interesting, but the zoomed out picture amounts to simply confusion. This was a group of actors given a topic to explore and through that exploration they created stories, movements, gestures, and loose dialogue around that topic. (If I had to guess the topic, I would say something along the lines of “feminism in today’s society.”) Then, anything that came out of this exploratory stage was pieced together for the longer piece. That’s not bad and is common strategy for collaborative new work, but the addition of Mee’s work and Chekhov’s classic felt more like an attempt to ground a play that got away from them than an actual framework for the piece. However, I do believe that the actors found something profound, deeply emotional, and incredibly relevant during the creation process. It’s in their eyes and their bodies. They have that passion behind what they’re saying that almost makes audiences want to cry or scream or laugh with them. But the package containing their message is too hectic to process. “Sensory overload” is the aesthetic of this production. At any given moment, there could be two people singing on one part of the stage, two others dancing, one person who was perhaps trying to tell a story (or at least speaking in full sentences), while still another person just stood there screaming (or screeching—depending on the moment). It’s overwhelming and almost impossible to follow. The cacophony occasionally grew to the point that actors had to use a handheld microphone to tell their story over the din. But the thing is, there were times where this aesthetic barrage calmed enough that a message began to shine through. This was the final third of the play. It was a breath of fresh air for an audience struggling to keep up. Whereas the first two thirds of the play tried to shove a message down the throats of the audience through movement and dance, the last third simply told a story that was elegantly supported by movement, dance, and song. Everything fell into place. The pieces finally coming together only accentuated the issues of the beginning of the production. It was a struggle to find that connecting thread between each scene. The assumption has to be made that they’re not connected and there isn’t a cohesive story being told from minute one to minute 90. But if that’s the case, this conglomeration of thoughts needs a frame. I guess the works of Chuck Mee and Anton Chekhov were meant to do that, but they acted more like contributors in a night of 10 minute plays than a framing device. I kept waiting for something to come along and tie everything together and give meaning to the chaos. Unfortunately, nothing ever did. Red Tape Theatre and Walkabout Theater Company present the world premiere of MOTHER OF SMOKE, playing March 23 – April 15, 2017 at Pride Arts Center (The Broadway), 4139 N. Broadway, Chicago. Tickets are currently available at www.redtapetheatre.org. More information is available at www.theatreinchicago.com. (center) Lucía Mier y Terán Romero and the ensemble of Red Tape Theatre and Walkabout Theater Company’s world premiere co-production of MOTHER OF SMOKE. Photo by Austin D. Oie. 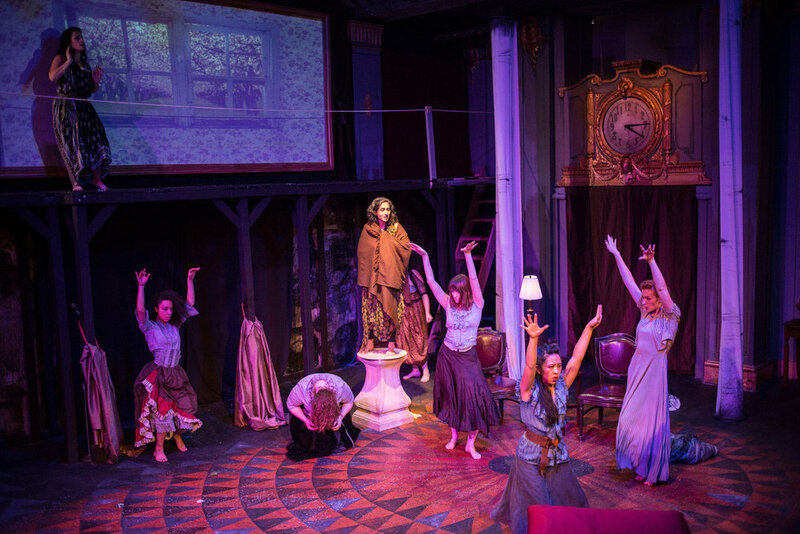 (left to right) Lucía Mier y Terán Romero, Ruth Margraff, Anita Darwish, Cooper Forsman, Kelsey Shipley, Nigel Brown, Emma Ladji and McCambridge Dowd-Whipple in Red Tape Theatre and Walkabout Theater Company’s world premiere co-production of MOTHER OF SMOKE. Photo by Austin D. Oie. 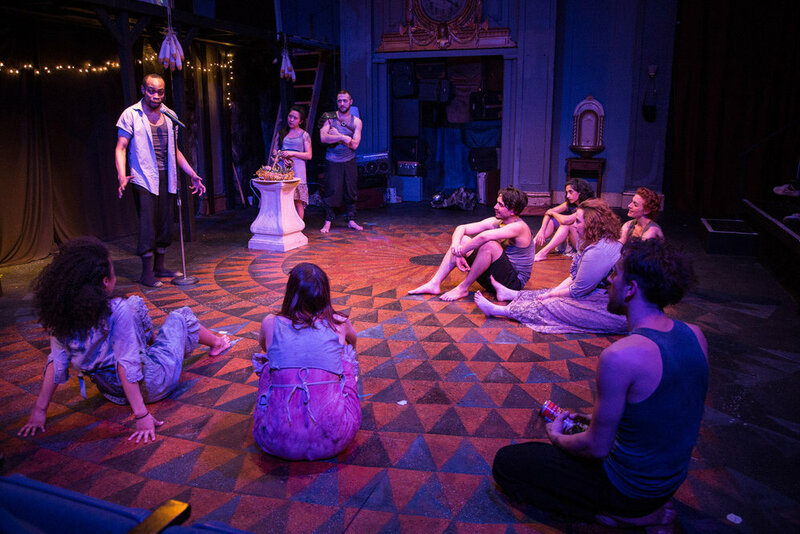 (far left) Johnard Washington with ensemble of Red Tape Theatre and Walkabout Theater Company’s world premiere co-production of MOTHER OF SMOKE. Photo by Austin D. Oie. (left to right) Nigel Brown, McCambridge Dowd-Whipple and Cooper Forsman in Red Tape Theatre and Walkabout Theater Company’s world premiere co-production of MOTHER OF SMOKE. Photo by Austin D. Oie. (left to right) Nigel Brown, Cooper Forsman, Johnard Washington and Alex Rodriguez in Red Tape Theatre and Walkabout Theater Company’s world premiere co-production of MOTHER OF SMOKE. Photo by Austin D. Oie. (front to back) Emma Ladji and McCambridge Dowd-Whipple in Red Tape Theatre and Walkabout Theater Company’s world premiere co-production of MOTHER OF SMOKE. Photo by Austin D. Oie.